While the standard dashboard may be perfect for what your brand needs, the initial set up is audience focused – giving top level session information (total users, total sessions, page views etc. ), however, the chances are you will want augment this view or start from scratch in order to ensure the information you want to see is readily available at a single click. The ‘Blank Canvas’ option has no widgets at all, as you would expect, while the ‘Starter Dashboard’ will have a default set of widgets which you can then add to or subtract from as your needs require. 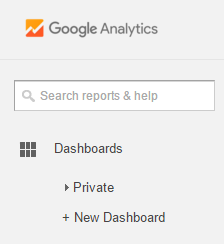 You should give your dashboard a descriptive name (this may not seem overly important at first, but as your needs and confidence grows with analytics, the number of dashboards will no doubt proliferate). Metric — a numeric representation of a single selected metric (sessions, bounce rate etc.). Timeline — a graph of the selected metric over time (comparable to a secondary metric). Geomap — a map of a selected region, with a specified metric plotted on the map. Table — up to two metrics describing a selected dimension in table format. Pie — a pie chart of a metric grouped by a dimension. Bar — a bar chart of a metric grouped by up to 2 dimensions. Dimensions describe characteristics of your users, sessions and actions – such as geographic location, browser or device type for example. Metrics are quantitative measurements, describing a characteristic of sessions – such as bounce rate, session duration, goal completion, to name a few. It must be noted that not all dimensions and metrics are compatible. For a metric to work well against a dimension, each must have the same ‘scope’ – i.e. that they should deal with the same overarching concern – be that users, sessions or actions. In order to ensure your custom dashboard does what it needs to do, it is important that you know what you want to measure and against what. Determine what you want to learn from the figures collected, and then select the widgets which best represent these aims. Configure the dimensions, metrics and other options to your taste and add any necessary filters to include or exclude any data as you see fit (excluding hits from your own or building’s IP address, for example) and name each widget. Again, be descriptive of the data it captures. One thing to note here is that a filter added to a dashboard only alters the data displayed in that report or dashboard, rather than a ‘view filter’ which permanently changes all incoming data. These widgets can, in future, be segmented to allow you to analyse subsets of your data. 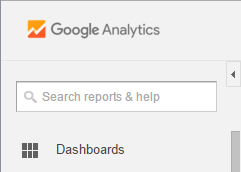 Dashboards can be edited at any time using the ‘customise dashboard’ option. There are three major types of segmentation – by ‘users’, by ‘sessions’ and by ‘hit’ (interactions including page views, transactions etc.). Segments are filters which do not change the data they impact, remaining active only until you remove it. Segmenting your data at this or later stages, will allow you to produce reports that focus on specific data subsets important to your brand – such as how many times a certain action is undertaken by specified user types within time or location ranges for example. You may only have a maximum of four segments applied to a single report. Want to skip a step? Click Consult has downloadable dashboard templates available for both SEO and PPC requirements available for free. Or contact us today to see how our commitment to measurability can help your brand.